Course design involves the planning of curriculum, assessments, and opportunities for learning which attempt to meet the goals of the course and evaluate whether those goals are indeed being met. The designing of a course can be adeptly performed through the use of backwards design, which is based on the principle of working first from the material and concepts you want students to master, in order to plan how you will assess whether this learning has occurred, and this information thus guides which resources and methods of teaching are employed in order to enact learning of this material. To what extent does the idea, topic, or process represent a “big idea” having enduring value beyond the classroom? To what extent does the idea, topic, or process reside at the heart of the discipline? To what extent does the idea, topic, or process require uncoverage? To what extent does the idea, topic, or process offer potential for engaging students? Also consider the goals and characteristics of your future students. Some reasons that students may be taking your course include: to develop a philosophy of life, to learn to interpret numerical data, to understand scientific principles or concepts, to learn to effectively communicate, to learn to organize ideas, or to understand how researchers gain knowledge. As the instructor, you can use this information, along with your own goals for the course, to guide your course structure and teaching pace. After having determined which material will guide the course design, the next step in backwards design is to establish the criteria you will employ to evidence student learning. Instead of using a lone cumulative exam to assess learning, however, backwards design is guided by the concept that understanding increases across time, as students process, reassess, and connect information. Therefore, assessments to measure this increasing level of understanding should be conducted throughout the semester, using a variety of methodologies such as discussions, tests and quizzes, projects, and assessments in which students analyze their own level of understanding. Once key concepts and assessment criteria have been decided upon, you can then focus on which teaching methodologies and activities you will use to help students reach these course goals. In this manner, teaching is driven by the concepts that are crucial to the course, rather than the course being driven by the teaching methodology itself. If you’re interested in learning more about effective course design, look into CTE’s Best Practices Institute. Please see examples one and two for graduate course syllabi and example three for an undergraduate course syllabus. Start with the basic information of the course, including the year and semester of the course, the course title and number, number of credits, and the meeting time/place. Provide your name, office address (and a map if it’s hard to find), and your contact information. Indicate whether students need to make appointments or may just stop in. If you list a home number, be specific about any restrictions for its use. Next, clarify what prerequisites, knowledge, skills, or experience you expect students to have or courses they should have completed. Suggest ways they might refresh skills if they’re uncertain about their readiness. When discussing the course, outline the course purpose(s); what is the course about and why would students want to learn the material? Outline the three to five general goals or objectives for the course (see Course Design above for more information), and explain why you’ve arranged topics in a given order and the logic of themes or concepts you’ve selected. When discussing the course format and activities, tell students whether the class involves fieldwork, research projects, lectures, and/or discussion, and indicate which activities are optional, if any. In regard to the textbooks and readings, include information about why the readings were selected. Show the relationship between the readings and the course objectives. Let students know whether they are required to read before class meetings. Also detail any additional materials or equipment that will be needed. Specify the nature and format of the assignments, and their deadlines. Give the exam dates and indicate the nature of the tests (essay, short–answer, take–home, other). Explain how the assignments relate to the course objectives. Describe the grading procedures, including the components of the final grade and weights for each component. Explain whether you will grade on a curve or use an absolute scale, if you accept extra credit work, and if any of the grades can be dropped. Also explain any other course requirements, such as study groups or office hour attendance. Clearly state your policies regarding class attendance, late work, missing homework, tests or exams, makeups, extra credit, requesting extensions, reporting illnesses, cheating and plagiarism. You might also list acceptable and unacceptable classroom behavior. Let students know that if they need an accommodation for any type of disability, they should meet with you to discuss what modifications are necessary. Include a course calendar with the sequence of course topics, readings, and assignments. Exam dates should be firmly fixed, while dates for topics and activities may be tentative. Also list on the course calendar the last day students can withdraw without penalty. Give students a sense of how much preparation and work the course will take. Please see the syllabi at the top of the page for examples of how these polices are written into a syllabus. We all have experienced some anxiety about the first meeting of class. Some faculty avoid “first day anxiety” by handing out a syllabus, giving an assignment, and dismissing the class. This only postpones the inevitable. It also gives students the sense that class time is not too important. Most of all, it fails to take advantage of the opportunity to use the heightened excitement and anticipation that students bring to the first day, the chance to direct that excitement toward enthusiasm for the class. On the first day, make sure that you arrive at the classroom early, to ensure that the equipment is working properly and to engage in small talk with students. Greet students at the door as they enter the class. When students enter your classroom, they have any number of things on their mind. To help them focus, many teachers use a hook, or a three- to five-minute activity to engage students at the beginning of class. (Some instructors use hooks at the start of every class throughout the semester.) 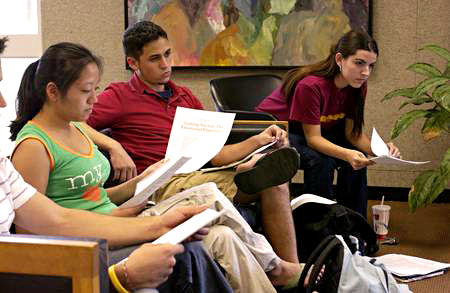 Ideas for hooks include playing music and asking students to think about how the lyrics relate to a class topic, presenting a question to the class to begin discussion, giving a brief demonstration of a principle you will be discussing that day, or projecting a photograph, cartoon, drawing, or chart related to the day’s topic. Some other recommendations for the first meetings of a course include making sure you start class on time and take attendance. Make note of any absences, and follow up with these students after class by contacting them through phone or e-mail. Have students give their name before they speak in class. Try to memorize a row of students every class period. Have students make name plates with 5” x 8” index cards. Ask students to fold the cards in half and write their names on them in large print. You can collect these name plates and hand them out at the start of every class, which will also serve as a means of taking attendance without using extra class time. Use students’ names as often as possible. If you’re teaching a large class, divide the entire group into smaller working groups. Give each group a short project, and learn the names of everyone in a particular group. Do this several times throughout the semester to learn each student’s name. Ask the students to provide index cards with their name, a photo, and an interesting fact about themselves. You can use these to study their names in between class meetings. Be honest with the students and patient with yourself. Your students have to remember the names of only four or five teachers every semester, while you have many more names of students to learn. Even if you call a student by the wrong name, the class will appreciate your efforts to acknowledge them on a personal level. Other ideas for the early meeting of a course include asking students to write out their expectations for the course, as well as what they hope to learn this semester. Assess the students’ previous knowledge by distributing a pre-test over the material you plan on covering that semester, and provide feedback on their responses as soon as possible. Each day, provide the structure for the day’s material using an outline on the chalkboard, overhead, or PowerPoint slide. This will help students see where the lecture is going, as well as aid the organization of their notes. Use multiple types of media for the presentation of the material, including overheads, films, audiotape, and models or demonstrations. To aid student participation early in the semester, have students write questions on index cards to be collected and answered during the next class period. Finally, gather student feedback regarding the beginning of the course. Ask the students to provide suggestions regarding ways to improve your teaching and their learning. Appleby, Drew C. “How to improve your teaching with the course syllabus.” APS Observer, May/June 1994. Davis, Barbara Gross. Tools for teaching. San Francisco: Jossey–Bass, 1993. “Syllabus Checklist.” (2002). Teaching Matters, 6 (1), 8. This material is drawn from Eddy, Judy. (2001). Creating a Syllabus. Handout. Wiggins, G. & McTighe, J. (1998). Understanding by Design. Merrill Prentice Hall: Upper Saddle River, New Jersey.